What type of guitar lessons do you offer? Guitar is a very popular instrument. At our Sherman Oaks studio, we offer lessons in a clean, state of the art music studio. We also offer a variety of guitar styles including, rock, metal, jazz, country, bluegrass, pop and more. Our guitar teachers are university trained working music professionals that love to teach. Whether you play electric, acoustic, or classical guitar our teachers can teach you proper guitar technique in all styles from Bach to Rock. We offer private lessons in 30 minute, 45 minute or 1 hour classes at our Sherman Oaks studio in Los Angeles. Over the years we have found the combination of a weekly private guitar lesson and weekly band rehearsals are very motivating to our students. 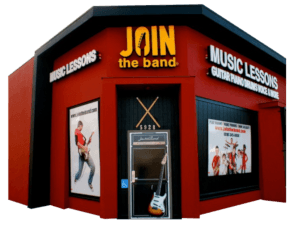 We also have our popular Join the Band® program that guitar students can join to play in a real band setting. What is a good starting age for kids to take guitar lessons? Eight to nine years old is the youngest we recommend for guitar lessons. Though we do take it case by case. Because of their smaller hands, the physical part of holding the guitar neck, pushing down strings with their fingertips, and holding a pick can very difficult for young children. We do have kids as young as six years old taking guitar lessons but we prefer to evaluate them first at the music studio. Do you offer guitar lessons for teens and adults? Yes, we have many teen and adult guitar students at Join the Band. If you are a beginner we have a great staff guitar teachers to get you playing faster. Our teachers also have many teen and adult guitar students at an intermediate and advanced level. Whether you are playing acoustic, electric or classical guitar, we have the right teachers for you. If you are starting lessons for the first time or you just need to hone your skills, our qualified staff of guitar teachers can customize a lesson plan just for you. I’m left handed. Can you still offer me guitar lessons? Yes, our guitar teachers can give you lessons if you are left handed. However, if are new to guitar and are left handed, choosing to play left handed or right handed is an important choice. Please keep in mind that they do not make left handed pianos, saxophones, flutes, etc…and many “left handed” people play these instruments all the time. Plus your choice of guitars is much greater if you learn to play “right handed”. Before you choose, we suggest coming in for an evaluation. One of our guitar teachers can give you guidance in making the right choice. When can I start my lessons? At Join the Band we offer music lessons year round..Fall, Winter and Spring lessons adds a valuable music lesson to your child’s school year. Summer lessons are a fun way to keep kids busy while school is out. We are located at 5928 Van Nuys Blvd, in the Sherman Oaks community of Los Angeles. Call To Start Guitar Lessons Today! Choose a music school that offers guitar lessons with experienced university trained teachers. Choose a music school that caters guitar lessons to meet your needs. Choose a music program with experienced guitar teachers. Choose a music school that offers yearly recitals.